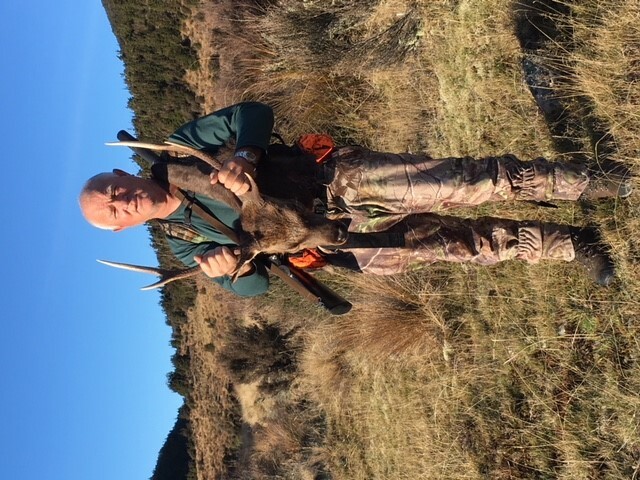 Early start last Wednesday driving down to Taupo from Auckland to catch the 9.30 chopper into Golden Hills Airstrip, we stopped off at Oamaru Hut to drop off two hunters (That's another story). The weather was a bit claggy and cold when we arrived at the hut so decided to have a snooze for a couple of hours. The weather cleared about mid afternoon so went for a walk up behind the hut and along a ridge line, sat there for an hour or so glassing a tussock gully and scrub, no action, freezing bloody cold so decided to head back to the hut. 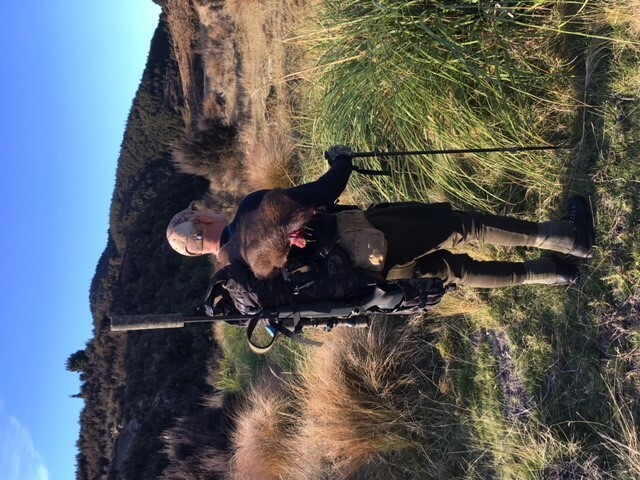 Next day a late start, mid morning getaway to the Western side of the block, nice warm clear day, Shifty and I set up to glass down into a dogleg tussock/scrub valley where we have been previously successful but once the sun sets behind the ridge line the temp drops fast. 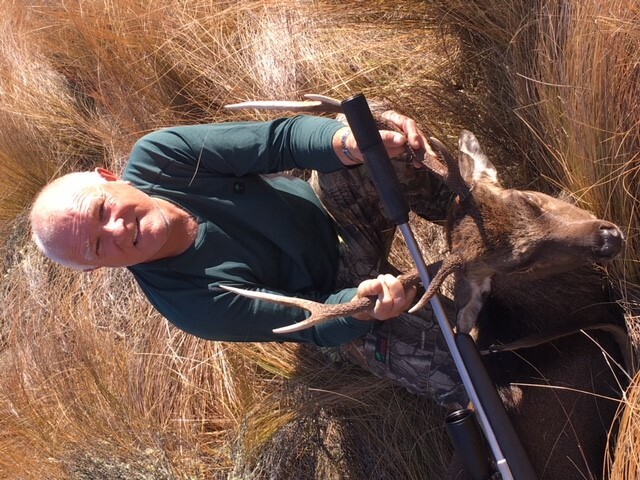 Later that day Shifty spots a nice hind at about 540yds, sets up and has a crack with his blousy 7mm rem mag, we later decide that the hind must have being wearing a bullet proof vest as it departed at a great rate of knots never to be seen again. Back to the hut we go to thaw out and grab something to eat and hit the sack. Next day up and away mid morning and down to the Southern end of the block to my favourite valley, along the way there's many places to sit and glass, we finally scrub bash our way up and over a ridge line to overlook my favourite spot, no sooner had we stopped to peel off our gear and set up for a tussock snooze and I spot two deer wandering in and out of a small patch of scrub about 600yds away. We decide to leave them and just glass the rest of the valley and see what materializes thru out the day and pot one of them as a last resort. No sooner had Shifty dozed off when Mr Staggy started to hee haw somewhere close to the two hinds, this was about 1pm. Peering thru my bino's I spot a flash of white antlers and Mr Staggy walking towards us at around 600 yards, a quick tap to Shifty's chest, hey we are on the money. I was happy to send him a message from where we were but Shifty wanted me to get a lot closer, the wind and terrain were in our favour, we had plenty of height on him and he had stopped by the creek without a care in the world. 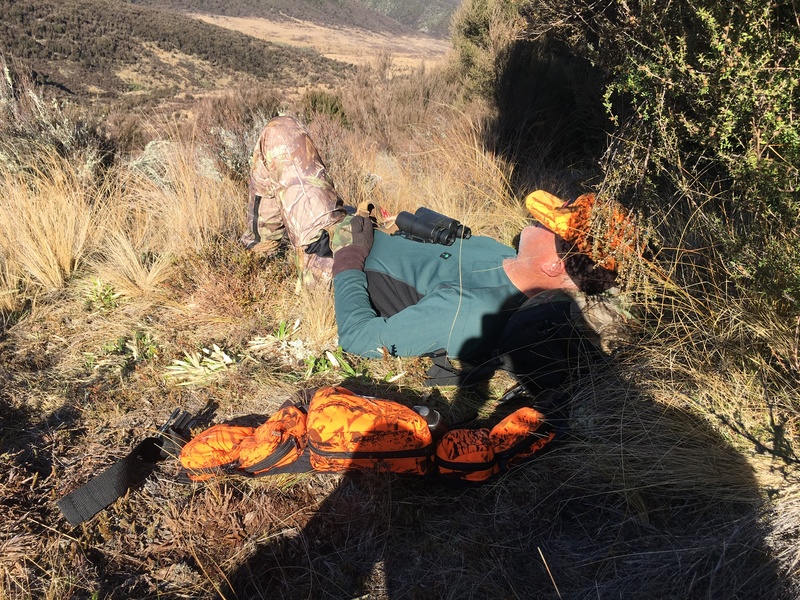 We packed up our kit and stalked out of view and popped out on a tussock bench 220 yards from him. Set up very quickly over my day pack and gave him a broad side shot and he dropped like a sack of spuds, He didn't know what hit him. Shifty helping me with pack out half of Mr Stag. The other few days in there were uneventful, not many deer seen but a bloody good getaway from work. We'll be back next year. On the way out we heard that one of the two guys we dropped off at Oamaru hut is recovering in hospital from a near fatal gunshot wound to the chest, FFS. Philipo, Shootm, Tahr and 14 others like this. Good work 300winmag. So Bevan is shooting a 7mm Rem Mag these days! Must catch up with him for a chat. Sounds as if your trip was a success, not so good for the other fella's. On ya Mate. Good that you had a good Tokoroa lad to help hump it home. 300winmag and shift14 like this. It was the reverse last year, he got the stag and I went home empty handed. Was good to get away, jeeze that freeze dried food makes you fart a lot. Bloody hell mate what's the go? You had fresh meat. 7mmsaum, 300winmag, Munsey and 4 others like this. At 60 you are bloody fit and well organised. I dunno how the body works, but my artificial hips were fkn sore after that stag retrieve....wtf ? 300winmag, 04sika and Gibo like this. So that makes us even. Father and son roar trip?